The Vision Metron 81 SL Carbon Wheelset is designed specifically for Time Trial riding. Featuring an 81mm deep & 24mm wide full carbon rim, straight pull bladed spokes, handbuilt to P.R.A hubs the Metron 81 SL is amongst the best in the business. The Vision Metron 81 SL Carbon Wheelset is full of quality components and features straight pull spokes with 6 sealed cartridge bearings in P.R.A hubs to create a radially and laterally stiff wheelset. The deep 81mm full carbon rim has been relentlessly tested in a wind tunnel to reduce air turbulence in straight lines as the air takes longer to hit the spokes whilst passing smoothly over the carbon rim. 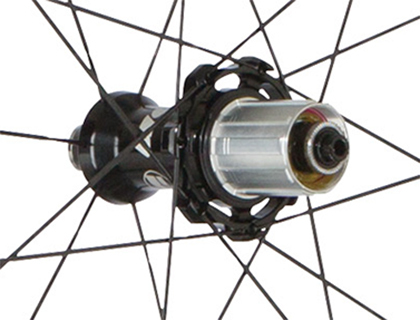 The stiff spokes, hubs and deep rim all contribute to a wheelset capable of incredible speeds. The Vision Metron 81 SL Carbon Wheelset has been found on pro-podiums 100+ times over the last few seasons, paying testament to the calibre of Vision's engineering and hand built quality. If you want a wheelset that is going to cut your race times, ride superbly and look stunning the Vision Metron 81 SL Carbon Wheelset has the features you need to take seriously.